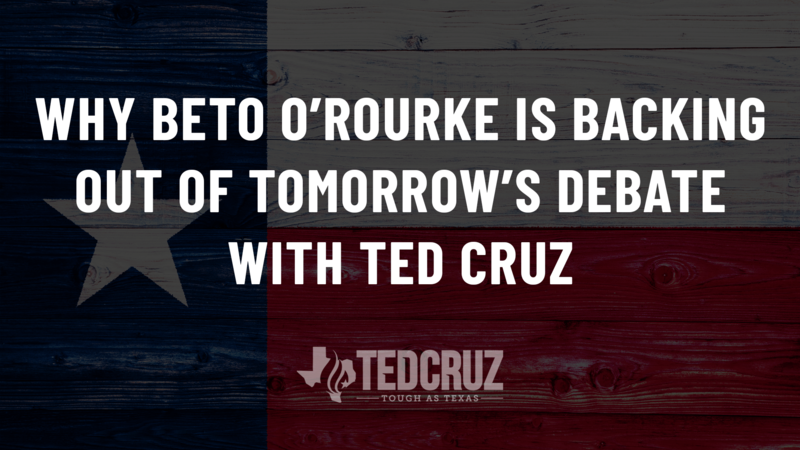 Tomorrow was supposed to be the first of five unprecedented debates that Ted Cruz proposed to his challenger Beto O’Rourke – more debates than any other U.S. Senate race in Texas history. The two candidates vying to serve each of our fellow 28 million Texans over the next six years were supposed to join on stage at 7:00 p.m. in Dallas to discuss their records and vision on the national economy, job growth and wages, trade and other serious matters that Texans care about deeply. Unfortunately, O’Rourke simply refused to participate. Now, the stage will be empty and Texas voters won’t witness this important debate because O’Rourke is too busy holding a political rally in…his hometown of El Paso. That raises the question why would O’Rourke duck the debate? If they have access to the truth, Texans won’t support O’Rourke and his extreme, out-of-touch views and troubling record so it’s abundantly clear he will hold out as long as possible before allowing voters to see this sharp contrast. That raises the question – as Texans, what can we do to change that? For starters each of us can share this campaign piece about Ted Cruz’s many accomplishments as well as the sharp contrast it represents with O’Rourke. You can print it off, email it or use social media to spread it around to your friends, family, neighbors, co-workers, and others. Help Ted Cruz set the record straight while his challenger continues to try to hide and distort his own. As always, thank you for being a loyal part of Team Cruz. We won’t be able to win this race without each and every one of you helping spread the message. The stakes are too high for each of us, our great state, and the nation. Have a safe Labor Day weekend, and let’s all get ready for the final push toward victory!